Federica Schiavo Gallery presents the first solo exhibition in Italy by Nicholas Byrne. An artist who, in painting “seems to have reprised Modernism’s dismembering of representation within his own work: a process that’s ongoing here as he works out some kind of algebra of bodily presence and absence, rehearsing different formulae”. The exhibition of six paintings and an architectural addition includes the artist’s largest-scale painting to date. 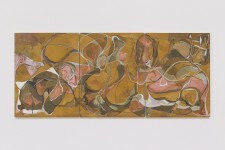 A work akin to religious paintings with folding panels and the formal language of Colour Field painting. In the core of the exhibition is the development of a ten year experiment in working with copper. 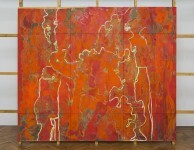 Four works where liquid oils are in cooperation with pictures etched on the surface. Inspired by a scratch, the raw openings will react to the space around them. Over a long time, growing black before turning Statue of Liberty green. Based in London. Nicholas Byrne’s work has previously been shown at The Hepworth Wakefield (2016), Schinkel Pavillion, Berlin (with Anthea Hamilton; 2015), Vilma Gold, London (2015), Outpost, Norwich (with Gili Tal; 2013), dépendance, Brussels (with Nora Schultzx, 2011) Kunstmuseum Ann Zee, Oostende (2010), Tate St Ives (2009), Studio Voltaire, London (2008).